Multi-national corporations like Facebook, BMW, Microsoft, etc. do not run lotteries. Lottery winners are not picked by email address. There is no such thing as a directory of email addresses, just the lists that scammers have. If you win a real lottery then you won't need to pay any money to receive your winnings. If you're asked to send money then it is 100% a scam. 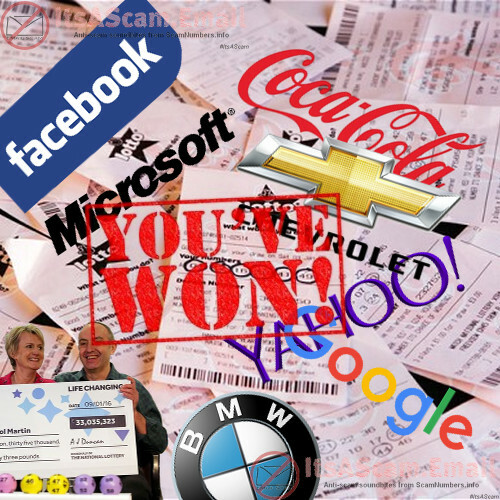 No real lottery would use free email addresses or notify winners by email. Legitimate lotteries like the UK National Lottery do not have processing agents in Africa, India or the Far East. If you didn't buy a ticket and match the numbers then you didn't win.